A published report says Bank of America is warning the holders of at least 1.2 million of its federal employee credit card accounts that a major security breach may have left their account information exposed to theft or hacking. Federal law enforcement is investigating the loss of several Bank of America data backup tapes that were being transferred across country by air when they disappeared in December. So far no evidence has been found to suggest that the tapes or their content have been accessed or misused. The bank said that the tapes are "now presumed lost". The government cardholder accounts included on the data tapes will continue to be monitored, and government cardholders will be contacted should any unusual activity be detected. Bank of America stated that no unusual activity has been observed. It added that its cardholders will not be held liable for any unauthorised use of their cards. A U.S. official told Time magazine that a large percentage of the accounts are for the Pentagon but that some 40 federal agencies and other entities are affected. Some of the tapes related to non-federal cardholders, the official added. About 162,000 Whirlpool and Kenmore dishwashers are being recalled. An electrical defect in the motor wiring poses a risk of the motor overheating and possibly catching fire. Whirlpool Corporation has received three reports of overheated wash motors. There are no reports of personal injury or property damage. Department and appliance stores and homebuilders nationwide sold the dishwashers from June 2004 through January 2005 for between $350 and $600. Consumers with one of these dishwashers should immediately stop using it, disconnect the electric supply by shutting off the fuse or circuit breaker controlling it, and inform all users of the dishwasher not to use it due to the risk of fire. Call Whirlpool Corporation to schedule a free, in-home repair. Please have the serial number and model number of the dishwasher available for the call. Please do not return the dishwasher to the retailer where it was purchased, as retailers are not prepared to take them back. 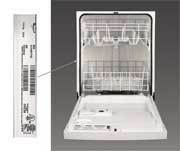 If you own a Whirlpool brand and Kenmore brand under-the-counter plastic tall tub dishwasher and have had service on your wash motor between August 2004 and January 2005, please call Whirlpool Corporation to determine if your unit is included in this recall and to schedule a free, in-home inspection. Call Whirlpool Corporation toll free at (866) 769-7260 anytime, or go to the firms Web site at repair.whirlpool.com. The fatal crash rate for 16-year-old drivers declined sharply after states began enacting graduated licensing laws in the 1990s, a new Insurance Institute for Highway Safety (IIHS) study found. Fatal crash involvements based on the population of 16-year-old drivers fell 26 percent during 1993-2003, the study found. The overall number of 16-year-old drivers in fatal crashes decreased from 1,084 in 1993 to 938 in 2003, while during the same period there was an 18 percent increase in the 16-year-old population. "This isn't a study of graduated licensing per se. It's a look at the status of 16 year-olds in states both with and without graduated licensing," said Susan Ferguson, the Institute's senior vice president for research. "Still, this study does reveal some very positive effects of the new licensing systems. The main reason for the decline in the crash rate is that fewer beginning drivers are getting their licenses when they turn 16." While the population-based ratio of fatal crash involvements declined, the 2003 rate based on the number of licensed drivers didn't change compared with the 1993 rate. Seventy-three 16-year-old drivers per 100,000 license holders were in fatal crashes in 1993. This compares with 74 per 100,000 in 2003. "In time we do expect to see a drop in the fatal crash rates per licensed 16-year-old driver," Ferguson said. Teenagers have the highest crash risk of any age group about four times higher than for older drivers. Teenagers are more likely than older drivers to be in crashes involving driver error and speeding. "The riskiest time for teens is when they first start driving," Ferguson said. "The key to the effectiveness of graduated licensing is that it phases in a driver's license over time, keeping teens in the learner phase longer and delaying a full-privilege license until beginners are older, more mature, and more experienced." An important finding of the new Institute study is that restrictions on 16 year-olds did not simply shift the crash risk to older teens. Crash rates dropped 11 percent for 17 year-olds and 6 percent for 18-19 year-olds. One of the most dangerous scenarios is when a teenage driver transports other teens and, on a per capita basis, this kind of crash declined 39 percent during 1993-2003. Meanwhile, most other characteristics of 16 year-olds' crashes stayed the same over time. A full graduated licensing law has three stages. Beginners must remain in each of the first two stages for minimum time periods: supervised learner's period; intermediate license (after the driver's test is passed) limiting unsupervised driving in highrisk situations; and then a license with full privileges available after completing the first two stages. Key elements of the intermediate stage include limits on unsupervised driving at night and transporting teenage passengers. Certification by parents that a learner has driven a minimum number of supervised hours also is important. Too much salt in the diet is boosting Americans' blood pressure and is prematurely killing roughly 150,000 people each year, according to a report issued by the nonprofit Center for Science in the Public Interest (CSPI). Despite the pleas of health experts to cut back, salt consumption has drifted upward over the past 30 years to the point where Americans are now consuming about 4,000 milligrams of sodium per day -- about twice the recommended amount. CSPI is filing a lawsuit against the FDA in federal court to compel the agency to classify salt as a food additive. Presently, FDA classifies salt as "GRAS," or Generally Recognized as Safe, which means that it is not closely regulated. "Americans spend more than $15 billion each year on drugs to treat hypertension, yet the government spends almost nothing to reduce salt consumption," said CSPI executive director Michael F. Jacobson. "And taking its cue from indifferent regulatory agencies, the food industry has done little to lower sodium levels in processed and restaurant foods." The 2005 Dietary Guidelines for Americans recommends that young adults consume less than 2,300 mg of sodium per day. People with hypertension, African Americans, and middle-aged and elderly people -- almost half the population -- are advised to consume no more than 1,500 mg per day. Nevertheless, sodium intake has increased steadily since the 1970s. "The medical community has reached a consensus that diets high in sodium are a major cause of high blood pressure as well as pre-hypertension, or blood pressure just short of high blood pressure," said Dr. Stephen Havas of the University of Maryland School of Medicine and a leading sodium expert. "High blood pressure and pre-hypertension significantly increase the risk of having a heart attack or stroke. Today roughly 65 million Americans have high blood pressure and another 45 million have pre-hypertension. Unfortunately, a lifetime of eating too much salt is putting Americans' lives in jeopardy," he said. Processed foods and restaurant foods contribute almost 80 percent of sodium to the diet, according to the 32-page report. Thousands of processed foods, such as frozen dinners and soups, contain between 500 and 1,000 mg of sodium per serving. Some Swanson Hungry Man XXL dinners contain more than 3,400 mg of sodium per package, and one, the Roasted Carved Turkey, contains 5,410 mg.
A package of Maruchan Instant Lunch ramen noodles with vegetables contains 1,400. And although a few companies offer reduced-sodium product lines (most notably ConAgras Healthy Choice products), CSPI says those are the exception rather than the rule. Among different brands of similar foods, CSPI found wide variances in sodium content. A two-tablespoon serving of Ken's Light Caesar salad dressing has 600 mg of sodium, while the same amount of a similar product, Morgan's Caesar, has 170. Progresso Vegetable soup has 940 mg of sodium per serving, while Healthy Choice Garden Vegetable has 480 mg.
Ragu Traditional Old World Style pasta sauce has 756 mg of sodium per serving while Classico Tomato and Basil has 310 mg. Another pasta sauce, Enricos All Natural No-salt-added, has just 25 mg per serving. Unlike packaged foods available in grocery stores, restaurant foods are not yet required to provide any nutrition labeling, and no major restaurant chain discloses sodium content on menus. Plenty of restaurant meals, including many Chinese entres, deli sandwiches, and breakfasts, provide more than a whole days worth of sodium. Dennys Lumberjack Slam breakfast has 4,460 mg of sodium and a typical order of General Tsos chicken with rice has 3,150 mg, according to the report. The bulk of Americans' salt intake is not coming from the salt shaker. Only about 11 percent percent of sodium in the diet comes from salt added while eating or cooking. "The high sodium content of the American diet -- mostly from processed foods -- represents an enormous health problem," said Dr. Claude Lenfant, president of the World Hypertension League. "If we could reduce the sodium in processed and restaurant foods by half, we could save about 150,000 lives per year." CSPI first sued the FDA over salt in 1983, when it asked a federal district court to direct the FDA to declare sodium a food additive -- a declaration that would have given the agency the authority to set limits for salt in foods. The FDA, though, had just begun requiring sodium labeling on some packaged foods and convinced the court that that measure should be given a chance to work. FDA told the court "if there is no substantial reduction in the sodium content of processed foods .... the FDA will consider additional regulatory actions, including proposing a change in salt's GRAS status." CSPI's new lawsuit, filed in the United States Court of Appeals for the District of Columbia, contends that since salt content in foods hasn't declined, the court should order the agency to finalize a decision on salt's regulatory status. "There is no way the FDA can look at the science and say with a straight face that salt is 'generally recognized as safe,'" Jacobson said. "In fact, salt is generally recognized as unsafe, because it is a major cause of heart attacks and stroke. The federal government should require food manufacturers to gradually lower their sodium levels." "When high-salt diets are turning so many Americans' hearts into ticking time bombs, American health policymakers are acting more like Keystone Kops than the bomb squad," Jacobson said. The complete text of the report is available at http://cspinet.org/new/pdf/killer_salt_final.pdf (Adobe Acrobat required). California Sues "Living Trust Mill"
California Attorney General Bill Lockyer and Insurance Commissioner John Garamendi have filed a $110 million-plus lawsuit against a living trust mill that tricked senior citizens into using their retirement investments to buy annuities that often made less financial sense for the elderly victims but earned the con artists substantial commissions and other income. "The perpetrators of this fraud deceived seniors into using their hard-earned retirement nest eggs to buy unneeded annuities that actually undermined their financial security," said Lockyer. • Attorney Thomas R. Lee of Woodland Hills. The complaint seeks more than $40 million in civil penalties, and a combined total of at least $70 million in consumer restitution and damages. Additionally, the complaint asks the court to permanently prohibit the defendants from engaging in the alleged unlawful business practices. The defendants' deceptive practices violated 18 separate provisions of the Business and Professions Code, Insurance Code, Civil Code and Corporate Securities Law, including several statutes designed specifically to protect seniors, the complaint alleges. The violations included unauthorized practice of law and obtaining business for an attorney by "running and capping," according to the complaint. Family First employed between 250 and 300 sales agents, and another 80 telemarketers who operated out of a call center in Corona, California. Aside from its Woodland Hills headquarters, Family First operated regional offices in Sacramento, Fremont, Concord, Santa Ana, Irvine, Canoga Park, Rancho Santa Margarita, Santa Maria, Westlake Village, Pleasanton and Bakersfield. The defendants deceptively sold tens of thousands of living trusts and related services, and annuities worth hundreds of millions of dollars, according to the complaint. "Defendants use the pretext of the offer and sales of ... estate planning products and services to establish confidential relationships with the consumers and find out about the consumers' assets," the complaint alleges. "Defendants then exploit those confidential relationships and use the financial information they obtain to induce those consumers to purchase annuities. Defendants make untrue or misleading statements about, and do not fully disclose the significant disadvantages of, the annuities they offer." • Through telemarketers, mailers, seminars, presentations at senior centers and other means, the defendants solicited elderly consumers, offering to come to their homes to provide free consultations about establishing or revising living trusts. They pitched their services as a way to avoid probate and reduce estate taxes. • Family First then sent sales representatives to victims' homes. Even though the representatives were not lawyers, they provided legal advice on estate planning. The representatives negotiated living trust transactions with consumers and executed sales contracts. To lend an air of legitimacy, they instructed victims to make checks payable to Group Legal Services, which kept some for itself, forwarded a set fee to Lee, and remitted the balance to Family First. • The sales representatives used these home visits to obtain personal financial information about the victims, including information about their assets. That information was used to facilitate the subsequent sale of annuities. At no time during the initial solicitation or the home visits did the defendants adequately disclose to the victims that their ultimate aim was to sell annuities. • Lee's employees prepared the living trust documents and sent them to Family First. Family First then deployed sales representatives, who were life insurance agents for American Investors, back into victims' homes. That's when victims were hit with the annuity sales pitch. The representatives told victims they should move a substantial portion of their assets to the annuities sold by the representatives. They advised victims to sell their securities and buy annuities without obtaining the required authorization from the Department of Corporations. • The sales representatives never fully informed the victims about the disadvantages of annuities, especially for elderly consumers. Those drawbacks include the fact that, during the time it takes for the annuity to mature (sometimes 15 years), consumers cannot withdraw more than specified amounts without incurring substantial financial penalties. That restriction could pose major problems for seniors facing health or other emergencies. The lawsuit is the second brought by the Attorney General's Office against a living trust mill. Two years ago, a state appeals court affirmed a multi-million dollar judgment against Fremont Life Insurance Company, which conspired with a living trust mill called Alliance for Mature Americans. Consumers who feel they have been victimized by the Family First defendants, or by another living trust mill or annuity fraud, should report it to their local district attorney or the Department of Insurance. Hi-Health Supermart Corporation has settled Federal Trade Commission charges that it made unsubstantiated advertising claims that its "Ocular Nutrition" formula can reverse the effects of macular degeneration. The company also claimed that its product could eliminate "floaters" -- the small specks that sometimes are seen moving in the field of vision. The proposed administrative consent agreement bans the company from making similar claims and also requires a payment of $450,000 to the FTC. The FTCs complaint alleges that Hi-Health, based in Scottsdale, Arizona, promoted Ocular Nutrition through a nationwide radio advertising campaign, including testimonials and other statements read on the "Paul Harvey News & Comment" radio show. In its advertising, the company promised that Ocular Nutrition would not just preserve eyesight, but actually restore vision lost to macular degeneration. It also claimed that several studies showed that the product could improve cataracts. In addition, the complaint alleges that the advertisements falsely claimed that a study shows that 83 percent of ophthalmologists recommend or prescribe Ocular Nutrition to treat age-related macular degeneration and cataracts. As ConsumerAffairs.com previously reported, a more widespread and serious ChoicePoint security breach was a strong possibility. The company has now conceded that is indeed the case. Previously the Georgia-based company, which keeps a massive database of personal information on virtually every American, revealed that criminals had gained access to some of its files, putting some 35,000 California residents at risk for identity theft. We noted at the time that California is the only state that requires such notification, and the problem could extend to other states. In a statement, ChoicePoint now says nearly 145,000 consumers' most sensitive information has been compromised, extending throughout the U.S. and into three territories. "We do not know how many of these approximately 145,000 consumers may be actual victims of identity theft but we have been informed by law enforcement officials that they have identified and directly notified approximately 750 consumers nationwide that some part of their identity information has been compromised," the statement said. The records were obtained by criminals pretending to be legitimate ChoicePoint customers, seeking information about individuals. Choicepoint said all its 17,000 customers are being re-screened to ensure they are who they say they are. "In addition to assisting law enforcement officials, we are taking voluntary actions at company expense to help affected consumers protect their identity. We want to tell you what we believe occurred and what information was released. We also want to provide you with details about what we are doing to inform and assist consumers that may be affected, and what we are doing to ensure we have reduced the possibility of future unauthorized access to personal information by criminals," the company said. Besides the nearly 35,000 affected consumers in California, notices of compromised records have gone out to 11,000 consumers in Texas, 10,000 in Florida, and 9,300 in New York. The company was founded in 1997 as part of a spin-off of Equifax Inc., a credit reporting agency. It has 19 billion public records in its database, including motor-vehicle registrations, license and deed transfers, military records, names, addresses, credit records and Social Security numbers. California Attorney General Bill Lockyer today announced that a major state-federal crackdown on unscrupulous marketers of work-at-home scams and 'business opportunity' plans has produced criminal and civil enforcement actions against more than 200 operations that have victimized tens of thousands of consumers in California and across the country. 'Consumers should be wary of television, radio or newspaper advertisements that promote can't-miss 'business opportunities' that will bring them lots of money if they buy a product and resell it to the public,' said Lockyer. 'The products often are very difficult to resell and have hidden costs. What's worse, the victims of these scams can lose their life savings,' he said. The enforcement sweep, known as Project Biz Opp Flop, is a coordinated effort launched by Lockyer's office, law enforcement agencies in 13 other states, the Federal Trade Commission (FTC), the U.S. Department of Justice (DOJ) and the U.S. Postal Inspection Service (USPIS). To date, more than 200 operations have been charged with criminal or civil violations of fraud and consumer protection laws. Business opportunity and work-at-home fraud can cause substantial consumer injury. In the FTC actions alone, consumers lost more than $100 million. In the California cases, the defendants defrauded victims out of more than $250,000. The crackdown has resulted in charges against defendants in 24 states and Canada, with the greatest number in California (11), Florida (26) and Arizona (7). Lockyer has brought enforcement actions against a number of companies which marketed business opportunity plans to sell vending machines that dispense pre-paid telephone cards and pre-paid debit cards. Those lawsuits yielded court orders prohibiting the unlawful practices, requiring victim restitution and awarding civil penalties. The FTC today also announced the referral of four new civil penalty cases to DOJ based on alleged violations of the Franchise Rule. On the criminal side, the U.S. Attorney's Office for the Southern District of Florida ' working with the FTC's Criminal Liaison Unit, USPIS and the DOJ's Office of Consumer Litigation ' recently filed charges against 14 individuals operating business opportunity scams. Lockyer reminded California consumers that if they are considering investing in a business opportunity plan they should make sure they obtain all necessary information about the program before they sign a contract. California law, he added, requires franchise sellers to register with the state Department of Corporations, and requires sellers of other business opportunities to file with the Attorney General's Office. 'Before investing, consumers should talk with a friend or financial advisor, and ensure the company is properly registered with the state and provides the disclosures required by California law,' said Lockyer. • Fraudulent ads use similar bait: Fast cash. Minimal work. No risk. And the advantage of being your own boss or working from home. • Before promoters can accept money from potential investors, the law requires that they give investors important disclosure documents. If the promoter does not make the document readily available, find another opportunity. • Talk to current investors, but beware of paid shills. Visit other business sites in person. And get professional advice if needed. Spending a few hundred dollars to talk to a lawyer, accountant or other expert is a wise move, especially when a life's savings is on the line. To help spot and avoid business opportunity scams, consumers should visit the FTC's web site at www.ftc.gov/bizopps or www.ftc.gov/workathome for information in both English and Spanish. State attorneys general are demanding that ChoicePoint notify all consumers whose personal data may have been stolen in an identity-theft operation. The company has told at least 30,000 Californians that their data is at risk because a state law requires it to do so. Residents of other states are in the dark. Others signing the letter include Attorneys General of Alaska, Arizona, Connecticut, Florida, Idaho, Indiana, Iowa, Maryland, Massachusetts, Michigan, Ohio, Oregon, New York, North Carolina, North Dakota, South Dakota, Vermont and Washington. ChoicePoint provides data to credit providers, government agencies, landlords and others looking to make business decisions based on a persons credit history and other factors. While no one knows the extent of the theft, only California has a law that requires companies to notify residents of a security breach. It is with great concern that we have learned about the fact that personal information in the possession of ChoicePoint, Inc., has been compromised and released to parties engaged in identity theft. It is our understanding that ChoicePoint has begun efforts to inform California residents that their personal information may have been compromised, Madigan wrote in a letter to the company. • ChoicePoint, Inc., should immediately inform all persons whose personal information is known to have been compromised, providing them with as much detailed information as possible about the breach and when it occurred, and urging them to check their credit reports for new accounts or suspicious activity. • For those persons whose personal information may have been compromised, ChoicePoint, Inc., should immediately inform them of this possibility, and urge them to check their credit reports for new accounts or suspicious activity. Madigan and other attorneys general also asked for a meeting with her office and the company to determine the extent of the damage caused to consumers and to discuss the steps the company must take to prevent this from occurring again. Madigan explained that companies or businesses subscribe to ChoicePoint to obtain personal and financial information such as Social Security numbers and credit reports. That information is used to make business decisions about potential customers based on their personal data. According to news articles, thieves were able to successfully subscribe to the service using falsified information. The thieves then would request under a new subscribers name a persons personal information. They then would take that information and open accounts with which to buy merchandise. Identity theft threatens a consumers financial health, credit rating and peace of mind, Madigan said. I will work to help make sure that ChoicePoint does the right thing by informing Illinoisans of any financial or identity theft risks they may face. Madigan said that consumers worried about the breach may consider ordering a credit report to check for any suspicious activity. While consumers would ordinarily have to pay a fee to obtain a credit report, starting March 1, every consumer is entitled to receive a free credit report from each of the three credit reporting companies. The annual free reports are available only through the centralized source set up by the three credit reporting agencies. If consumers contact the companies directly they will still be charged for their credit reports. To obtain the free reports after March 1, consumers can call 1-877-322-8228, order online at www.annualcreditreport.com or complete the Annual Credit Report Request Form, available at www.ftc.gov/credit, and mail it to: Annual Credit Report Request Service, P.O. Box 105281, Atlanta, GA 30348-5281. Imagine a system that tracks your every move. Everywhere you've ever lived, everytime you've paid -- or not paid -- rent, every place you've moved to, a system that collates all the data about you, good and bad, and spits it out in the form of a random number. Know what? The system already exists. It can determine whether or not you'll get a place to live, and its decisions tend to be final. Worse, the people that use these numbers on a day-to-day basis can't explain exactly how the system works, or what happens when it doesn't work. No, Microsoft isn't getting into real estate, although they do play a part in the story we're about to tell. Welcome to the world of rental screening. There are literally hundreds of agencies throughout the United States alone that offer comprehensive rental screening services for landlords, property managers and real estate brokers. Each agency or service claims to provide exhaustive records on a prospective renter's history, including their credit background, arrest record (if any), employment verification, and proof of identity. First American Registry (FAR), the self-proclaimed "nation's largest resident screening company" claims "an exclusive database of 34 million landlord-tenant records and lease performance histories reported by property managers nationwide." YouCheckCredit.com offers instant tenant screening reports and credit checks "24 hours a day, 7 days a week, 365 days a year" -- all "in less than 10 seconds via the Internet." In addition to rental histories, ASAP Screening in Florida helpfully provides "pre-employment screening services including criminal searches, driving records, credit reports, social searches, drug testing, and workers compensation claims reports." Rental screening, overall, has become a serious business practice within the last decade or so. Yet, within that time, the practice has generated huge numbers of companies and industry ventures who are willing to share information quickly and efficiently with anyone who asks -- anyone, that is, except the consumers themselves. According to Julia Thompson, president and founder of References-Etc.com, individuals can get turned down for a job or denied a chance to rent an apartment, and "never know why. The letters that people have a right to see never get sent out, even though employers know that they should be, due to the Fair Credit Reporting Act (FCRA)." Jeffrey Wilens, a California attorney specializing in consumer law, believes rental screening can harm consumers for years, due to "stale or incomplete information about a previous lawsuit". Consider this. A rental screening system can provide potential landlords an instant credit check in less than an hour. Yet in order for an individual to gain access to their own credit file, they either have to be denied credit, fulfill the terms of a free credit disclosure as mandated by the FCRA, or pay one of the three major credit bureaus to see their own report. And not only that, the reports a consumer sees may differ greatly than what a leasing manager or landlord sees. What goes into the rental screening process? Who performs it? And most importantly, why does it exist? Next: Who's Been Sleeping In My Bed? Emmpak Foods, Inc., of Milwaukee, is recalling approximately 123,000 pounds of ground beef that may be contaminated with hydraulic fluid, the U.S. Department of Agriculture's Food Safety and Inspection Service announced today. 1-pound packages of "GROUND BEEF, WITH NATURAL FLAVORINGS, 73/27." 1-pound packages of "EXTRA LEAN GROUND BEEF, WITH NATURAL FLAVORINGS, 96/4." 1-pound packages of "LEAN GROUND BEEF, WITH NATURAL FLAVORINGS, 93/7." 1-pound packages of "SIRLOIN GROUND BEEF, WITH NATURAL FLAVORINGS, 90/10." 1-pound packages of "CHUCK GROUND BEEF, WITH NATURAL FLAVORINGS, 80/20." 1-pound packages of "ROUND GROUND BEEF, WITH NATURAL FLAVORINGS, 85/15." 1-pound packages of "FRESH GROUND BEEF FOR CHILI, WITH NATURAL FLAVORINGS, 85/15." These products bear sell by dates of 1/31/05, 2/1/05 or 2/2/05. Each package also bears the code, "Est. 20654" inside the USDA mark of inspection. The ground beef was distributed to retail stores in Illinois, Indiana and Wisconsin. 1-pound packages of "LAURA'S LEAN BEEF, GROUND BEEF, 8% FAT." 1-pound packages of "LAURA'S LEAN BEEF, GROUND ROUND, 4% FAT." These two products bear a sell by date of 2/1/05. Each package also bears the code, "Est. 20654" inside the USDA mark of inspection. These products were distributed to retail stores in Florida, Illinois, Maryland, Massachusetts, New Jersey, North Carolina, Pennsylvania and South Carolina. The problem was discovered after FSIS received a consumer complaint. Anyone concerned about an injury from consumption of the products should contact a physician. Consumers with questions about the recall should contact company Customer Service Representative Luke Miller at (866) 567-7899. Criminals broke into a database that contains information on virtually every U.S. citizen, exposing as many as 100,000 consumers to identity theft and other crimes. The thefts occurred last October but are just being admitted by the company. The database is operated by Georgia-based ChoicePoint, which has mailed letters to at least 35,000 Californians who have potentially been affected. The letters say that consumers' personal information, including bank account, credit card and Social Security numbers may have been accessed by unauthorized individuals. California is the only state that requires companies such as ChoicePoint to notify consumers in writing when their private information is stolen. Thus, there's no way for Americans in the other 49 states to know if they're potentially affected. The company initially said that only Californians were affected but has now conceded that up to 100,000 records may have been compromised. In its letter to 35,000 Californians, the company recommended they their credit reports for unauthorized activity and any sign of identity theft. ChoicePoint stores an estimated 19 billion public records on American residents, including names, addresses, Social Security numbers and credit reports. Insurance companies, government agencies, law enforcement and other customers also use the service for background checks. ClearPoint sells its stored information to the US government and private business - landlords and credit companies are among those who use the reports to make risk assessments on potential clients. The hackers apparently gained access to the records by making bogus applications to set up more than 50 ChoicePoint accounts, which they then used to trawl the database. he scam came to light when a ChoicePoint employee noticed a suspicious application to open a customer account. Investigators then discovered 50 active bogus accounts belonging to non-existent debt collection and insurance agencies, as well as other fronts. The Washington-based consumer privacy group, Electronic Privacy Information Center, was quick to seize on the security breach. It has consistently tangled with ChoicePoint over security and privacy matter in the past. Earlier this month EPIC asked the Federal Trade Commission to begin an investigation of ChoicePoint for its compliance with federal privacy laws. Toyo Tire has announced the recall of a targeted batch of 24 medium duty radial truck tires produced in the GTY plant in Mt. Vernon, Ill., during the week of Dec. 12-18, 2004. A defect which relates to motor vehicle safety is possible on tires manufactured with DOT production date codes of "5004". To date, there have been no reports of accidents, injuries or property damage, a company news release said. The affected tires were built with a non-specified rubber compound in the shoulder area of the tire. As a result, the overall durability of the tire is reduced. During extended operation, the shoulder area of the tire could lift, resulting in a degraded ride and handling. Failure to replace the tires will lead to tread separation and possible loss of vehicle control that could result in a crash. For tire pickup and shipment, contact Yellow Freight at (800) 459-7834. All tires involved in this action will be replaced at no charge if received by Toyo on or before Aug. 7, 2005. For affected tires received after this date, the tire credit will be based on the remaining unused tread depth. Questions regarding this recall action may be directed to Toyo at: (800) 442-8696. Ford is recalling nearly 360,000 Ford Focus cars to fix a potential problem with their rear door latches. the problem involves about 358,857 vehicles from the 2000-2002 model years and stems from a build-up of corrosion around the rear door latches which can eventually prevent them from ensuring the doors are secure. "If not latched properly, the door may open while the vehicle is in motion," NHTSA said. The Focus has set new recall records since its introduction. This is the tenth safety recall conducted in the U.S. There have also been several defect investigations. Less than two weeks ago, Ford recalled nearly 800,000 F-150 pickups and related SUVs and minivans because of fire risks involving their cruise control switches. The operator of World Express RX has been sentenced to 51 months in prison and ordered to forfeit the profits from what prosecutors called one of the largest Internet pharmacy schemes ever. Mark Kolowich was sentenced by U. S. District Court Judge Jeffrey T. Miller in San Diego. Kolowich had pled guilty to conspiring to sell counterfeit pharmaceuticals, commit mail fraud, and smuggle pharmaceuticals, and conspiracy to launder money. In a related case in Florida, Kolowich pled guilty to conspiring to import unapproved drugs into the United States, introducing such drugs in interstate commerce, and smuggling unapproved drugs into the United States. Assistant Attorney General Peter D. Keisler said, "The Department of Justice's increasing willingness to pursue court action and criminal penalties against those who are diverting and counterfeiting prescription drugs for profit should communicate our commitment to stop those who threaten the health of the public." United States Attorney Carol C. Lam of the Southern District of California also announced that charges have been filed in San Diego against five other individuals in a related Internet pharmacy fraud case involving MyRxForLess.com. The simple fact is that when people use the Internet to obtain prescription drugs, they take a risk because the drugs might not be what they appear to be. Consumers need to be aware that many of the safeguards that exist for bricks-and-mortar pharmacies do not exist for Internet pharmacies," Lam said. Kolowich operated an Internet pharmacy website at www.WorldExpressRx.com, from which customers could order prescription drugs without having a prior prescription. The website directed the customer to fill out a health questionnaire, and pay a $35 fee for a doctors consultation. The website falsely represented that a doctor would review the questionnaire and issue a lawful prescription before the drugs were shipped to the customers. However, there was no doctor employed by, or otherwise associated with, World Express RX, who reviewed the questionnaires. "The sophisticated criminal scheme carried out by the defendants in this case reinforces why FDA strongly advises consumers against buying medicines from websites and underscores the efforts of FDA's Office of Criminal Investigations to protect American consumers from counterfeit and unsafe prescription drugs sold over the Internet," said Dr. Lester M. Crawford, Acting FDA Commissioner. The distributed pharmaceuticals included tablets and capsules containing the active ingredients for Viagra, Cialis, Levitra, Propecia, Celebrex, and Xenical, which were marked by World Express RX as generic versions of those drugs. Kolowich caused counterfeit drugs to be manufactured in Mexico, and co-conspirators smuggled the phony drugs across the border into California. The drugs were then packaged by co-conspirators and sent to customers throughout the United States and the world. Some of the ingredients for the drugs were shipped in from China and India using false shipping documents. Kolowich also conspired with co-defendants John Aldaz, a licensed pharmacist in the United States, and a physician in Mexico, and Gustavo Garcia-Uriza to smuggle unapproved Viagra from Mexico into the United States. Kolowich had planned to manufacture unapproved versions of Cialis and Viagra with Aldaz and Garcia in Mexico prior to his arrest. Garcia turned the pill press dies for these drugs over to the Government at the time of his sentencing. Co-defendant Chris Reed in San Diego handled the credit card processing for World Express RX. He was a partner with Kolowich in World Express Processing. Kolowich and Reed offered their services, for a fee, to other Internet pharmacies which were unable to get traditional banks to handle their processing. World Express Processing received about $1 million per month from credit card charges in 2003, about half of which resulted from sales from World Express RX or its affiliates. In addition to smuggling prescription pharmaceuticals into the United States from Mexico, Kolowich also conspired to have unapproved drugs made in India and Pakistan enter the United States via the Bahamas, prosecutors said. Kolowich conspired with Douglas Matthew Drew in Miami, Florida, and Jean Francois Blanc in the Bahamas to import the counterfeit Viagra, in the case that originated in the Southern District of Florida. As a result, counterfeit drugs were shipped from India to Blanc in the Bahamas. Blanc then shipped the drugs to World Express RX customers in the United States. More than 900 of these packages were intercepted in Miami in September 2003. The government seized approximately 1.6 million pills in Florida, valued at approximately $9.8 million. Blanc pled guilty to charges in the Southern District of Florida for his role in the scheme, while Drew pled guilty to unrelated charges. Now What? Does Verizon Buy MCI? It's official. The boards of SBC and AT&T have approved the sale of AT&T to SBC for about $16 billion. SBC thus becomes a juggernaut with enormous holdings in local, long-distance and wireless communications. • Put MCI and Sprint, which just bought Nextel, into play. The new entity will include SBC's local telephone properties in Texas, California, Connecticut and much of the Midwest, AT&T's long-distance business and SBC's roughly 50 percent ownership of Cingular, which recently acquired what was formerly known as AT&T Wiress. The transaction is certain to elicit howls of protest from consumer advocates, who will claim it reduces competition and drives up prices. The deal puts Verizon, now the nation's largest telecommunications company, in the hot seat. If it wants to maintain its No. 1 spot, its most likely takeover target would be MCI, the nation's second-largest long-distance company. For SBC, the AT&T acquisition is mostly about going after business customers in a big way. The AT&T name, though extensively tarnished in recent years, still resonates with older business types looking for reliable business telephone and networking services. Though among telecom groupies, SBC has a reputation for fearlessness, or perhaps ferocity, it remains largely unknown outside its Texas base, which has been a disadvantage in selling service to large corporate clients. Though Sprint now becomes a potential takeover target, the fact that it -- unlike AT&T and MCI -- operates a large wireless venture makes it problematic for Verizon and BellSouth. Since they both have large wireless holdings too, there would likely be stiff anti-trust opposition to their acquiring Sprint. Qwest, the runt of the Baby Bell litter, is in no shape to acquire anything and is hardly an attractive takeover candidate and thus remains where in its customary spot ... on the sidelines. What, then, becomes of AT&T's fabled -- or, if you prefer, infamous -- brand name? Because SBC's name is so little known and unharmonious, many marketing types are urging it to keep the AT&T moniker, at least on the AT&T portion of the business. Corporate pride being what it is, it's not likely SBC will dump its own name and take on that of its latest prize. When Cingular bought AT&T Wireless, the theory goes, it stuck with its own rather pedestrian brand name. Maybe Cingular would be a singularly simple solution? The entire collection could be named Cingular, assuming BellSouth didn't object. If it did, SBC could simply acquire it as well.